Olivier Rabault looks worried. Where is the rain? One might be forgiven for thinking that the last activity you would expect to see in a northern French vineyard in July would be the ceremonial rain dance, but this is shaping up to be another crazy vintage. After the scorcher of 2003, growing conditions in 2004 so far have been unnaturally dry, and with broiling heat settling over the vineyards of Anjou in the fourth week of July, there is genuine concern that the vines and their little bunches of micro-berries will get heat-stressed. Almost as though St Vincent himself were eavesdropping on the conversation, Rabault’s prayers are answered. That afternoon, while we are admiring the fruit set of some Chenin Blanc at Chateau de Montguéret, a mighty torrent descends over Anjou, the kind of rain through which you can barely see, and that has us scurrying for the refuge of the cuverie. Still, the vines look as though they are lapping it up, even if we aren’t.I was in the Loire to celebrate the continuing renaissance of Rosé d’Anjou and its pink siblings. 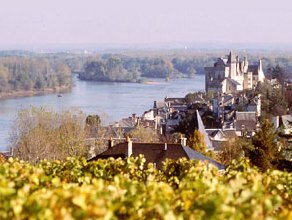 With the exception of the odd little patch of Provence, Anjou is pretty much Rosé Central in France. Whereas once, however, aficionados may have been tempted to dismiss the bulk of its production as over-sulphured, fruitless frumps, things are definitely now looking up. The figures bear out the point. Exports to the UK of Rosé and Cabernet d’Anjou in the first four months of this year were up by over 36% on the equivalent period last year, and market share is growing. Industry statistics recently showed that a staggering 34% of wine sales in Britain are now accounted for by pink wine. And it ain’t all California blush. At Château de Fesles in Thouarcé, I taste a wine that is an absolute case in point. The Le Jardin cuvée 2003 (Oddbins, £6.49) – made up of 70% of the indigenous grape Grolleau with 30% Gamay – is a peach of a wine. That is to say, it has the precise scent and flavour of ripe white peach, and a perfect balance of natural residual sugar and positive fruit. Grown on clay-silica slopes, it is the product of a short maceration of no more than 18 hours, as well as cool fermentation, techniques that have preserved all its eloquent fruit-soaked freshness.Chateau de Montguéret, an expansive property at Nueil-St-Layon owned by the Lacheteau family, supplies a range of bottlings to the UK supermarkets. Some of these I found rather lacking in focus, perhaps because the buyers with the most muscle are looking above all for continuity between vintages with a style like off-dry rosé. The Sainsbury’s Rosé d’Anjou (£2.99) seems an apologetic wine. Better is the Safeway/Morrisons Rosé d’Anjou 2003 (£3.99), a sturdier blend of 80% Cabernet Franc to 20% Grolleau, with discreet sugar and a fugitive note of little pippy redcurrants. As we sip the 2003 Montguéret Cabernet d’Anjou, a wine with a strong sugar attack on the palate, backed up by a whisper of cherry fruit, Guillaume Lacheteau attempts a little consumer profiling. ‘This is a particularly good wine for elderly Chinese ladies,’ he advises, a judgment we must just take on trust, although I have a feeling its customer base may turn out to be a little broader than that. I also visited Domaine des Deux Arcs at Martigné-Briand, where the thoroughly engaging team of Gazeau père et fils makes some charming rosés. The all-Grolleau Domaine des Deux Arcs Rosé d’Anjou 2002 shows what can emerge from a little bottle-ageing, which the younger Gazeau, Jean-Marie, feels the best rosés deserve. This wine, which was macerated for 20 hours, has lost some of its colour, and has a strangely savoury nose like salami, and yet its delicate cranberryish fruit remains intact, and the subtle note of sweetness in the wine keeps it feeling fresh. The estate consists of only 37 hectares, and for the time being, les Gazeau are content not to export significant volumes, although lucky Highlanders can taste them at an Aberdeen restaurant, the Enigma Bar-Brasserie, Belmont Street (01224 637373), where the proprietor imports them directly.